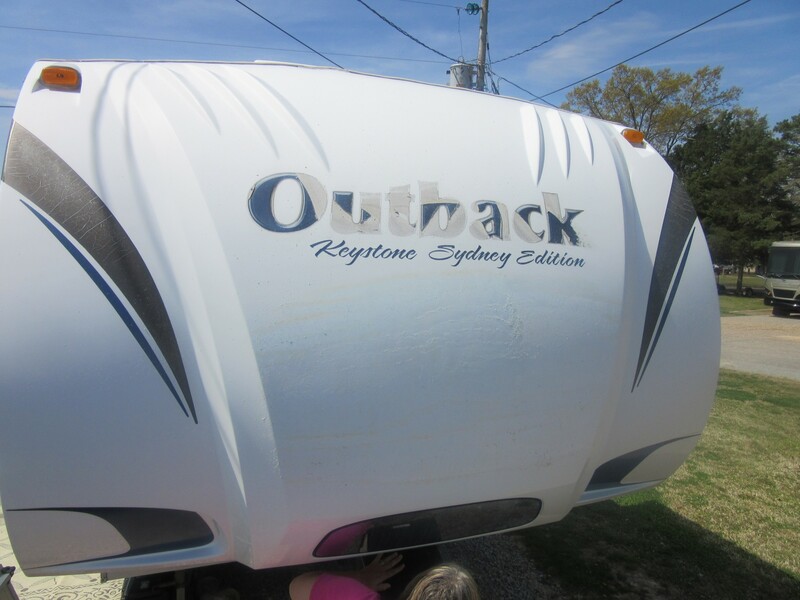 April 10, 2016 (by Jimmy) – No, we didn’t sell the RV; however, I have done something that I have wanted to do since we bought it. 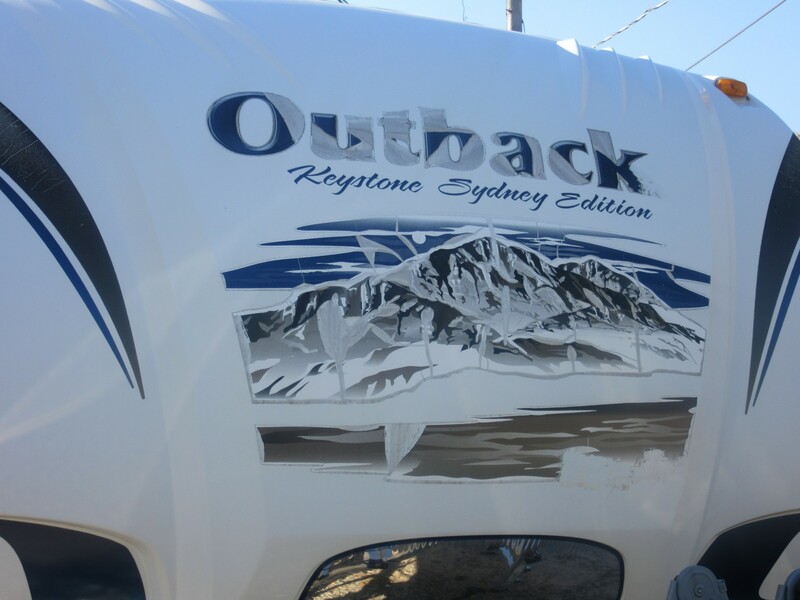 I have removed the decals on the front of the RV. 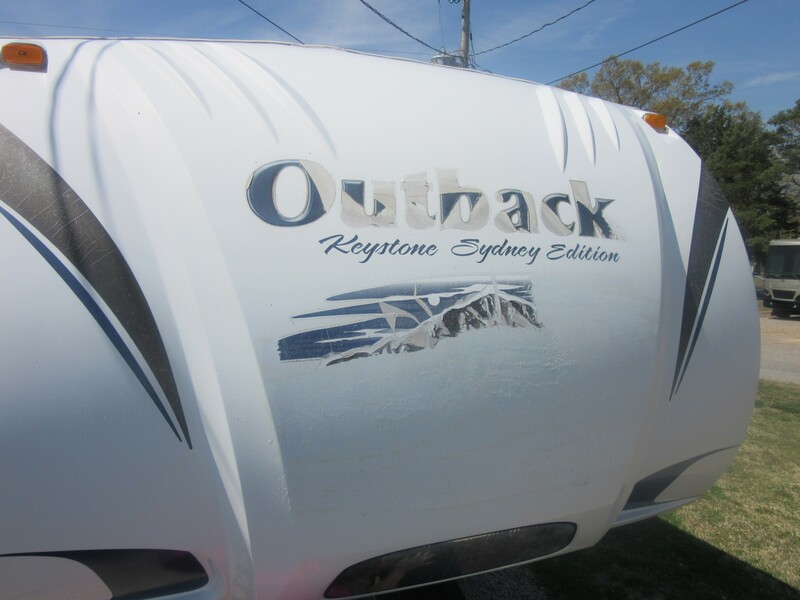 When we bought the RV, the front decals was wearing badly, and we asked about it. 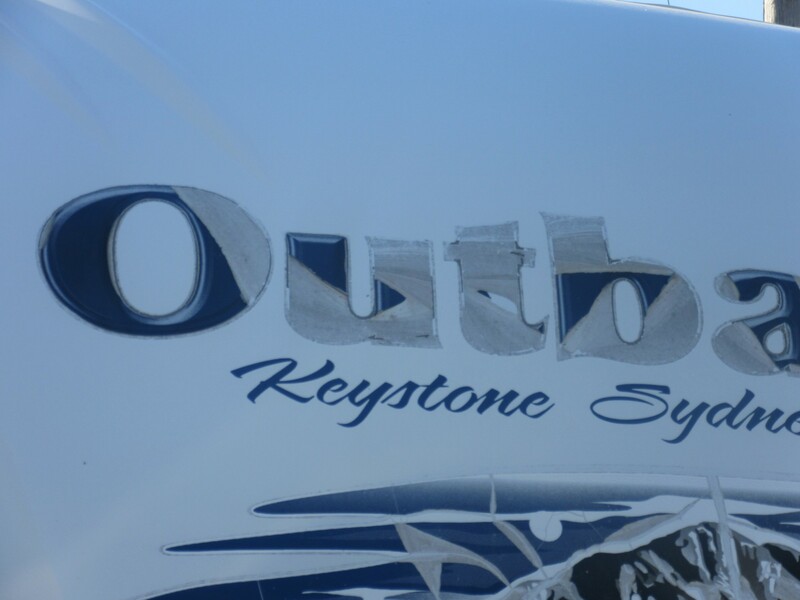 We were told that the 2010 Outback’s decals were of poor quality. Of course, we thought they were just trying to sell the RV, but since then we have heard that from other sources. Here’s what the decals looked like when I started the removal. As you see,the decals are on their last legs. The mountain looks like it suffered an earthquake, and it looks like there is some kind of brown water under it. 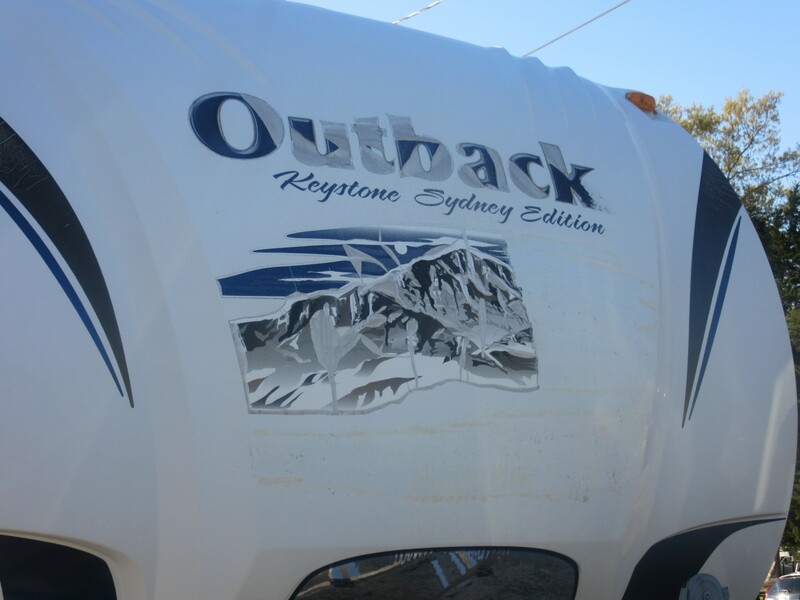 “Outback” is barely legible. 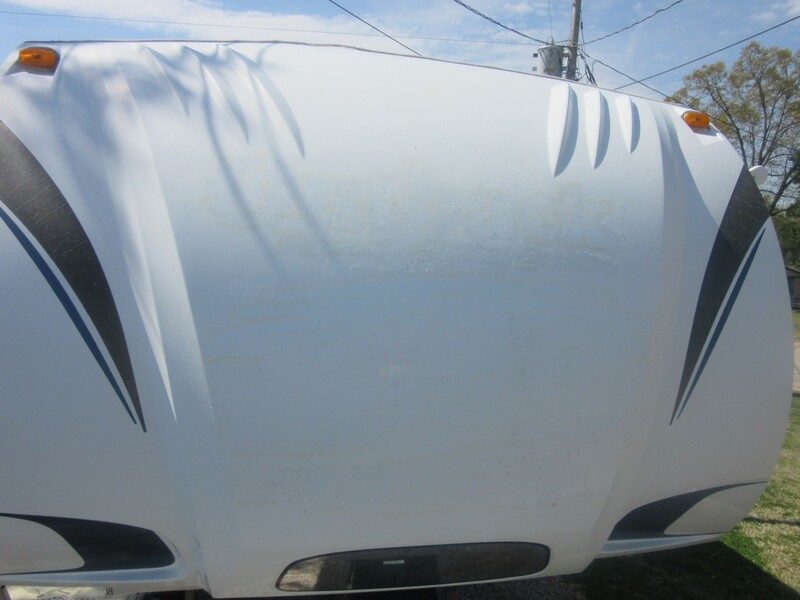 The general condition of the prominently displayed decals makes the entire RV look much older than it really is. 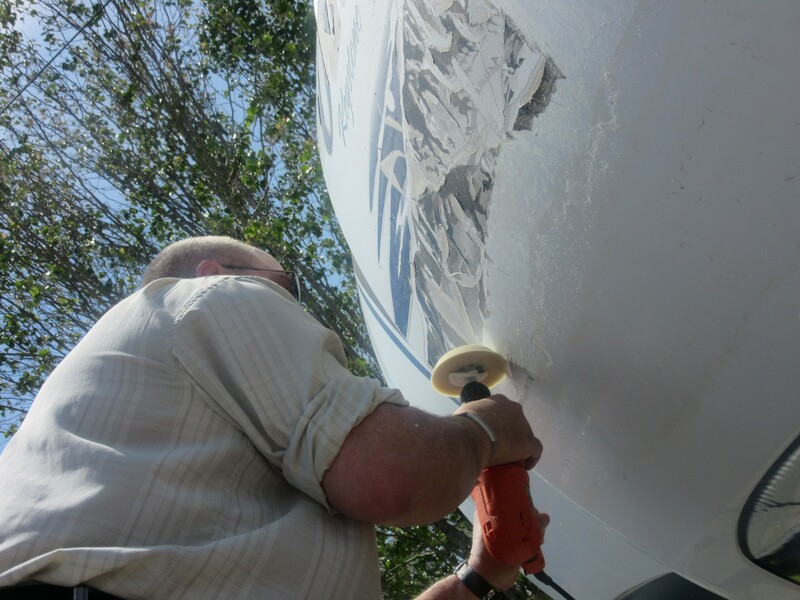 There are a number of ways to remove decals, and if you want to research them, you can go to “You Tube” (I did). My selection of removal method was to use an eraser tool that is attached to a drill. It is hard on the hands, but doing a small section at a time, I found, worked best. I was worried that the eraser would pull up the paint, but it removed the mural and nothing more. It did leave a sheen of adhesive that has to be removed, but I’ve been told that this can be accomplished by using a product called “Goof Off.” I have the product, but as of this writing have not applied it. 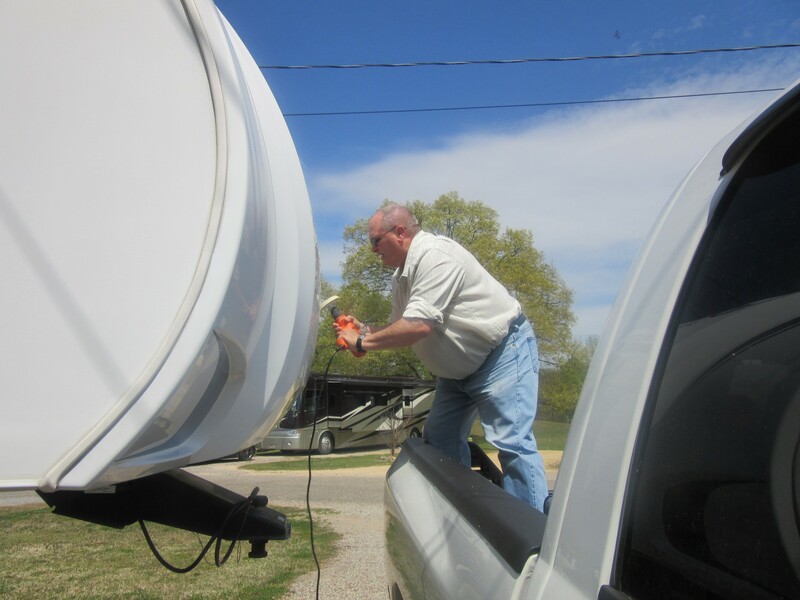 Angela was concerned about me being on a ladder, so she had me use the truck. It did come off rather well. Now with the decals removed, soon the space will be prepared for a new decal. 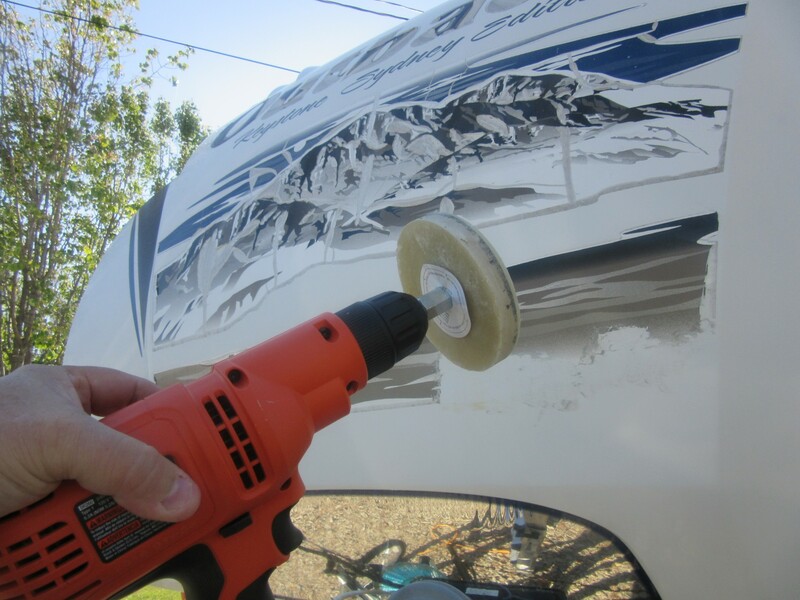 I would like to hear from all of you who are reading this to provide suggestions regarding what we should put on the front of our RV. Angela and I have ideas, but we want to hear what you think. One thing we know is we are going to create a custom decal to replace the one removed. We plan to put “Jimmy & Angela Johnson” at the top and “ajhomeontheroam.com” underneath, but the section in the middle is still being debated. So help us out and let us know what you think. Thanks in advance. And here I half thought you would have suggested the Beacon Light House.